Every January, a travelling circus of astronomers and their friends rolls into an American city. This travelling carnival, the winter meeting of the American Astronomical Society, brings together literally thousands of people, ostensibly to give talks about cutting edge research, but more importantly to meet, greet, gossip and collaborate. 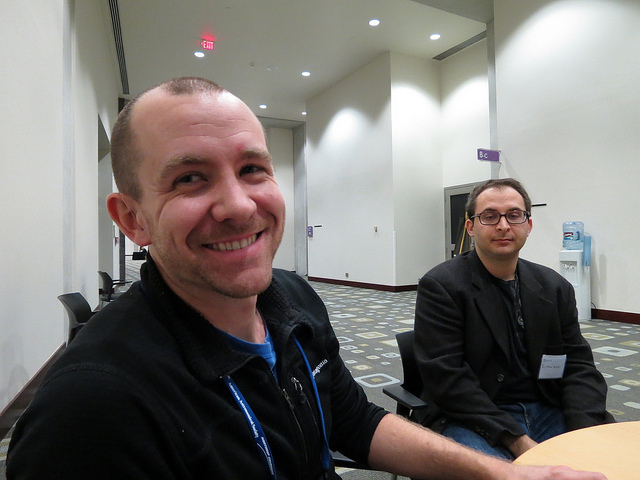 This year’s festivities started in Austin, Texas over the weekend, and amongst the gathered throng are many of the Zooniverse astronomers, who contributed to a Monday that demonstrated the wonderful use to which the hard work of registered volunteers is being put. I missed some of the morning sessions, but was in the main conference hall to hear Bob Benjamin plug the first Milky Way Project paper, soon (we hope) to be accepted following a very positive referee’s report. The more than 5000 bubbles discovered by MWP project participants will, he said, help us map the nearby galaxy. This high-profile support followed a talk given over the weekend by MWP science team member Matt Povich to a smaller gathering of early-career researchers who are funded as National Science Foundations fellows. Also presenting was Planet Hunters’ very own Meg Schwamb, and after lunch it was my turn to present Zooniverse results, announcing the discovery of two new planet candidates by volunteers. Particularly pleasing here was the involvement of the Talk tool, specifically developed to make it easier for the science team to follow up on interesting discoveries. Last time the astronomers of America gathered in Austin, we were less than a year into Galaxy Zoo, and the highlight was the arrival during the meeting of the first high-resolution spectrum of Galaxy Zoo’s famous Voorwerp. It was therefore particularly pleasing when Kevin Schawinski nudged me in an early talk, pointing out the appearance on Chandra’s schedule of observations include observations of the Voorwerp’s neighbouring galaxy, IC2497. Those observations arrived on Monday afternoon and Bill Keel, Kevin and I had a happy few minutes pouring over them (we only had a quick look image, so there’s a limit to what we can say!). There’s lots of work to be done before we can draw too many conclusions, but we’d struggled to win Chandra time, so it’s wonderful to see data flowing. Just down the corridor, Sarah Kendrew from MWP was talking to Ramin Skibba from Galaxy Zoo about techniques for matching different clases of objects. After the plenaries, Kevin, Bill and I joined a dozen or so members of the Galaxy Zoo team, who are presenting five times over the next few days, making sure that we’re making the most of Galaxy Zoo results. The discussion was about the next iteration and iterations of the GZ site, but that’s a story for another time. A few hours, and a few different sessions, and Zooniverse science had been highlighted in several different ways. There’s no doubt that the kind of ‘citizen science’ projects at which the Zooniverse excels are becoming more popular, and you’ll see more of them both from the Zooniverse and elsewhere over the next few months. The acid test, though, remains whether a project can actually produce science, an outcome that’s the result of careful design, smooth implementation but also of commitment and hard work from scientists like those on the Milky Way Project, Planet Hunters and Galaxy Zoo teams. Without those things, it’s incredibly easy to waste a large amount of volunteers’ time, breaking the implicit contract that exists between project team and volunteer when we ask for your help. Of the eight Zooniverse projects that were live at the beginning of 2011, six (the three already mentioned along with Solar Stormwatch and Galaxy Zoo : Supernovae which have papers, and Old Weather has contributed data to its climate scientists) have serious published results. Of the other two, we now have funding for a three year Moon Zoo postdoc in London to make use of the data that’s been collected, and I have a meeting tomorrow to look at the results from 5 million simulations in the mergers project. It’s a track record that everyone involved with the Zooniverse can be very proud of, a challenge to anyone thinking of launching their own projects, and it’s certainly getting us notice amidst the chaos and clamour of AAS. Thanks a million for making it happen, click, by click, by click. It looks like you are all having a good time. I suppose the time in creating a Zoo, has to be offset by the science it returns. In the case of Planet Hunters, a lot of discoveries have been made by software, though the recent two discoveries were made by the human eyeball, though I expect someone will be modifying the software to allow for this! Other uses of CZ projects, is getting people re-interested in science, such as the number doing OU courses and the recent speech by David Willetts will hopefully interest people in GZ – recently there has been some new names appearing in GZ’s Chat.